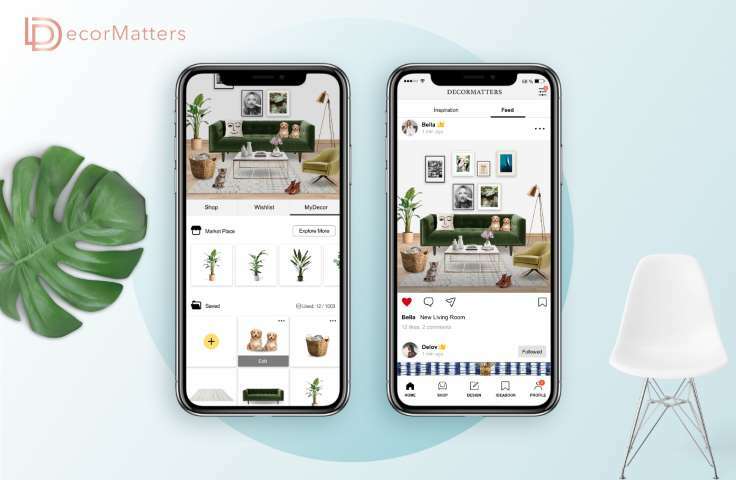 MyDecor will unleash the creativity and empower the productivity of the three million active users in the DecorMatters in-app design community. DecorMatters, the tech-driven interior design platform, today announced the launch of the MyDecor marketplace. MyDecor is designed to meet the ever-growing demand for virtual home goods, including photographic and 3D models of home decor, furniture, pets, and more. MyDecor will unleash the creativity and empower the productivity of the three million active users in the DecorMatters design community. Many renters and new homeowners are faced with a challenge when designing their home: how to figure out what their existing furniture and decor items will look like paired with new pieces they are considering purchasing. With MyDecor, do-it-yourselfers and professional interior designers have access to a powerful tool that allows them to see their existing and potential home items together in a virtual space. View their existing furniture in a new place when paired with new items. Users can now see how their own items will look in a new space without physically moving it. When shopping for something new, people usually just guess that it will pair well with what they currently have. With MyDecor, users can see how everything will look before making any purchases. Design a room using their own inventory. Interior designers or stagers will no longer need to rely on others to create designs for their clients, a process that can take days to complete. They can now do it in minutes on their mobile device anywhere. Create professional-quality designs. With MyDecor, users can adjust the lighting and shadows to make their items look even more realistic. Now they have access to images in MyDecor that have been edited by hand to create the highest-quality look. Sell and buy digital assets. In a future release, the ability to buy and sell 3D models in the MyDecor marketplace will become available. Selling 3D models will be beneficial for retailers, as they can promote the sales of their real furniture and also turn their passive virtual inventory into a revenue-generating asset.